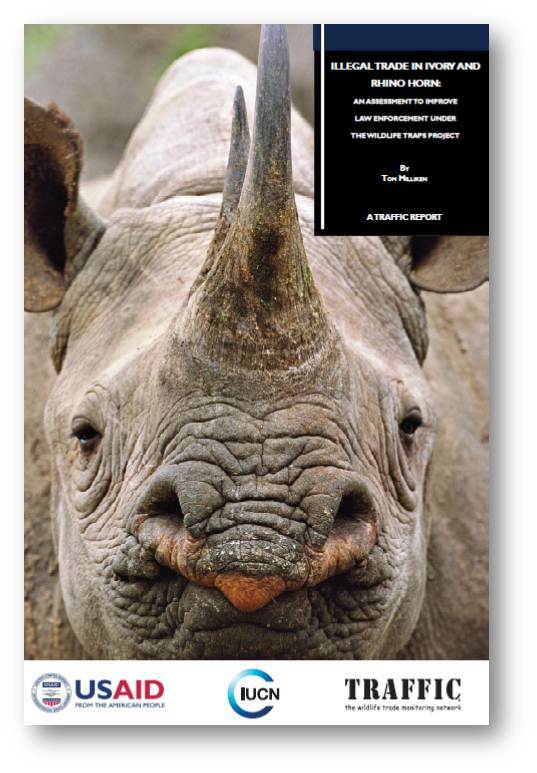 New Report Tracks Illegal Ivory, Rhino Horn Trade « What Happened to the Portcullis? A new report released by the U.S. Agency for International Development (USAID) partner TRAFFIC reveals that illegal rhino horn trade has reached the highest levels since the early 1990s, and illegal trade in ivory increased by nearly 300 percent from 1998 to 2011. The report, Illegal trade in ivory and rhino horn: an assessment to improve law enforcement, is a key step to achieving USAID’s vision to adapt and deploy a range of development tools and interventions to significantly reduce illegal wildlife trafficking, USAID said in a September 22 press release. The report was prepared by the wildlife monitoring network TRAFFIC in partnership with USAID. The assessment uses robust analysis to identify capacity gaps and key intervention points in countries combating wildlife trafficking. Seizure data indicate that “the fundamental trade dynamic now lies between Africa and Asia,” according to the report. In China and Thailand, elephant ivory is fashioned into jewellery and carved into other decorative items, while wealthy consumers in Vietnam use rhino horn as a drug that they mistakenly believe cures hangovers and detoxifies the body. Rhinos and elephants are under serious poaching pressure throughout Africa, with even previously safe populations collapsing. Central Africa’s forest elephants have been reduced by an estimated 76 percent over the past 12 years, while in Tanzania’s Selous Game Reserve elephant numbers have fallen from 70,000 in 2007 to only 13,000 by late 2013. A record 1,004 rhinos were poached in 2013 in South Africa alone, a stark contrast to the 13 animals poached there in 2007 before the latest crisis began. Record quantities of ivory were seized worldwide between 2011 and 2013, with an alarming increase in the frequency of large-scale ivory seizures (500 kg or more) since 2000. Preliminary data already show more large-scale ivory seizures in 2013 than in the previous 25 years. Although incomplete, 2013 raw data already represent the greatest quantity of ivory in these seizures in more than 25 years. Both rhino horn and ivory trafficking are believed to function as Asian-run, African-based operations, with the syndicates increasingly relying on sophisticated technology to run their operations. In order to disrupt and apprehend the individuals behind them, the global response needs to be equally sophisticated, USAID said. “There’s no single solution to addressing the poaching crisis in Africa, and while the criminals master-minding and profiting from the trafficking have gotten smarter, so too must enforcement agencies, who need to improve collaborative efforts in order to disrupt the criminal syndicates involved in this illicit trade,” says Nick Ahlers, the leader of the Wildlife Trafficking, Response, Assessment and Priority Setting (Wildlife-TRAPS) Project. The USAID-funded Wildlife-TRAPS Project seeks to transform the level of cooperation among those affected by illegal wildlife trade between Africa and Asia. Rhino horn is often smuggled by air, using international airports as transit points between source countries in Africa and demand countries in Asia. Since 2009, the majority of ivory shipments have involved African seaports, increasingly coming out of East Africa. As fewer than 5 percent of export containers are examined in seaports, wildlife law enforcement relies greatly on gathering and acting on intelligence to detect illegal ivory shipments. The report recommends further developing coordinated, specialized intelligence units to disrupt organized criminal networks by identifying key individuals and financial flows and making more high-level arrests. Also critically important are improved training, law enforcement technology, and monitoring judiciary processes at key locations in Africa and Asia.